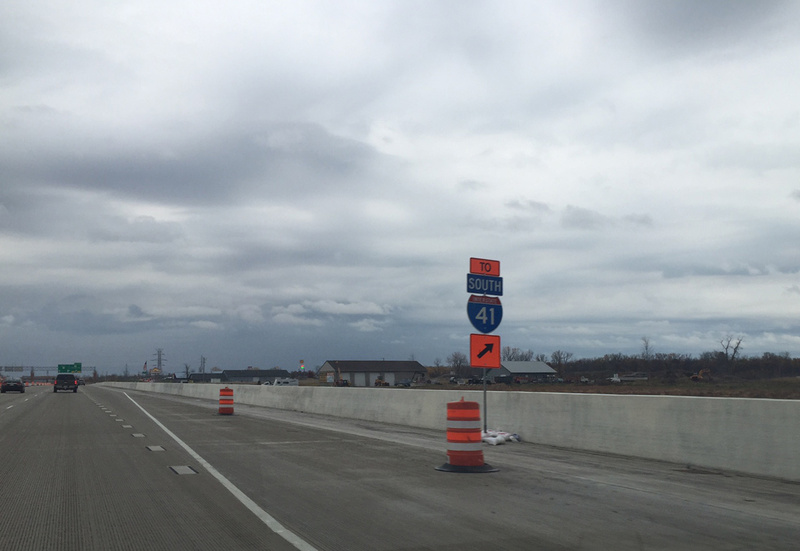 The first signs for Interstate 41 posted in Wisconsin were installed during the evening of May 29, 2015. This sign appears along Wisconsin 172 eastbound at the interchange with I-41 in Ashwaubenon. Photo taken by Peter Johnson (05/30/15). Interstate 41 creates the unusual situation where a U.S. route changes into an Interstate route with the exact same number (U.S. 74 and Interstate 74 do the same thing at Rockingham and Laurinburg, North Carolina). U.S. 41 will not be acknowledged from intersecting routes or along freeway guide signs however. Interstate 41 is part of High Priority Corridor 32: Wisconsin Development Corridor and High Priority Corridor 57: U.S. 41 Corridor from Milwaukee to Green Bay for its entire length. Greenfield Avenue Interchange – the Greenfield Avenue bridge was replaced in 2013. Landscaping and the addition of a decorative wall were anticipated for 2016 or 2017. Ramp closures continued through early summer 2018. Watertown Plank Road Interchange – upgrading the original diamond interchange into a free-flow directional cloverleaf interchange. This work was completed by the end of 2014. Bluemound Road Interchange – new ramps were added from the Interstate 41 & U.S. 45 mainline to U.S. 18 (Bluemound Road). Work reconstructed Bluemound Road over I-41 during 2014-15. Ramp construction followed from 2015 to summer 2018, with ramps to and from Wisconsin Avenue removed during the project. Zoo Interchange – crews will build a four-level interchange with 23 new bridges and 12 new retaining walls. 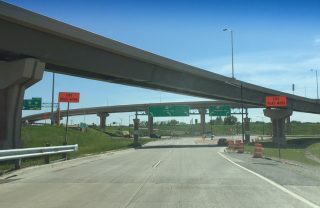 Additionally I-41 & U.S. 41 will be expanded with new lanes, as will the connecting ramps. Construction commenced in late 2014 and runs through 2018. North Avenue Interchange – reconstruct the parclo interchange with slight geometric changes to improve safety. Engineering and design work was anticipated for 2016, with construction following in 2017-18. Improvements however were to be determined by 2018. 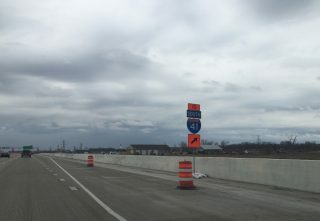 South on I-41 at Wis 29 and Wis 32 at the high speed systems interchange completed in early 2015. Local traffic continues straight on Shawano Avenue while regional traffic exits towards Wausau. Photo taken by Peter Johnson (06/17/15). 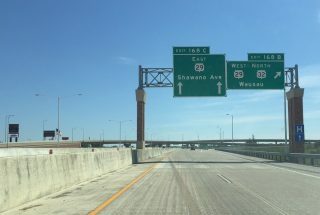 The southbound off-ramp from I-41 to Wis 29 / Shawano Avenue approaches a three lane roundabout. The bridges above are part of the I-41 / Wis 29 directional T interchange for regional traffic. Photo taken by Peter Johnson (06/17/15). Ramps at the northern terminus of Interstate 43 closed as part of the September 2013-December 2016 project on October 23, 2015. The interchange fully reopened on August 26, 2016. A WisDOT map of the US 41 Conversion showed the proposal to extend Interstate 41 southward along all of Interstate 894 and I-94 south from Milwaukee to the first exit in Illinois.3 Logic behind this overlap retained mileposts and exit numbers along the preexisting U.S. 41 freeway between Milwaukee and Green Bay. 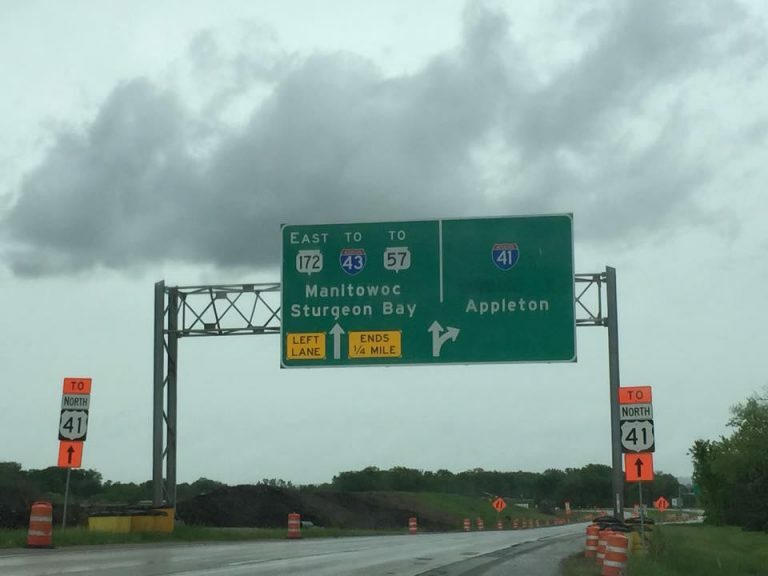 The non-freeway portion of U.S. 41 along Appleton Avenue from the Stadium Freeway/Miller Park Way northwest to Exit 47 of I-41 near Menonmonee Falls was renumbered as an extension of Wisconsin 175. Lineville Road (County Trunk Highway M) interchange – work completed from June 2013 to May 2015. I-41 was expanded to six lanes below a new overpass for CTH M while ramps were expanded to two lanes. I-41 and I-43 Interchange – work started in September 2013 and ran through December 2016. The new northbound ramp from I-43 to I-41 opened on July 27, 2015. Following was opening of the new I-41 north to I-43 south flyover opened on August 28, 2015. The new flyover from I-43 north to I-41 south opened on August 26, 2016. Construction replaced all loop ramps with directional ramps as part of new directional T interchange. Adjacent work separated movements to Velp Avenue (U.S. 141) and eliminated weaving traffic to and from I-43. Packerland Drive – WIS 29 Interchange – work completed in early 2015 included construction to add flyovers from and to Wisconsin 29 & 32 leading west from Interstate 41 & U.S. 41. The new directional T overlays a diamond interchange with roundabouts at Shawano Avenue. WIS 172 Ramps – construction started in fall 2013 and concluded in fall 2016. Ramps were expanded and realigned to join new collector distributor lanes along Interstate 41. Work in Winnebago County affected 17 miles of Interstate 41 & U.S. 41 from Wisconsin 26 to Breezewood Lane. Construction was completed between 2009 and 2014. Upgrades included a new eight lane Lake Butte des Morts Causeway, reconstruction of four interchanges, and the addition of 16 roundabouts. Of this work, the interchange with U.S. 45 received a substantial makeover with free flow movements added from north I-41 to north U.S. 45 and from U.S. 45 south to I-41 south. The last confirming marker for Intestate 41 procedes back to back ramps for Velp Avenue / U.S. 141 south and CTH HS north (Exit 170A) and the southbound beginning of Interstate 43 (Exit 170B). Photo taken by Peter Johnson (06/14/18). Less than three miles remain along Interstate 41 north to Brown Count M (Lineville Road). U.S. 141 commences a 16-mile overlap with the U.S. 41 freeway north to Abrams from the ensuing on-ramp. Photo taken by Peter Johnson (06/14/18). A distributor roadway separates from Interstate 41 north to U.S. 141 (Velp Avenue) south and the two lane flyover for I-43. The systems interchange joining Interstates 41 and 43 was completed in December 2016. Photo taken by Peter Johnson (10/28/16). Continuing past the north end of Interstate 43, I-41 & U.S. 41-141 advance with four northbound lanes across wetlands west of Peats Lake. A pair of end shields for I-41 precede Exit 173 with Lineville Road (CTH-M). Photo taken by Peter Johnson (06/14/18). A lane drop occurs at the north end of Interstate 41 for Exit 173 to Brown County M. Lineville Road separates the villages of Howard and Suamico. Photo taken by Peter Johnson (06/14/18). The diamond interchange (Exit 173) joining U.S. 41-141 with CTH-M (Lineville Road) was upgraded to a dumbbell interchange during the I-41 conversion project between 2013 and 2015. Photo taken by Peter Johnson (06/14/18). US 41 & 141 north at the Lineville Road overpass where I-41 ends. Photo taken by Peter Johnson (06/17/15). The first reassurance signs that omit I-41. US 41 & 141 continue as a freeway for about 13 miles until a directional T interchange at Abrams. Photo taken by Peter Johnson (06/17/15). U.S. 41-141 south enter the dumbbell interchange (Exit 173) with Brown County M (Lineville Road). Interstate 41 begins just beyond the exchange. Photo taken by Peter Johnson (06/17/15). Lineville Road separates the villages of Suamico and Howard above the U.S. 41-141 freeway at Exit 173. Photo taken by Peter Johnson (06/17/15). The first I-41 reassurance sign appears just south of the Lineville Road entrance ramp. Photo taken by Peter Johnson (06/14/18). A new begin I-41 sign was posted on November 5, 2015. I-41 & U.S. 41-141 continue south with four lanes to the systems interchange (Exit 170B) with Interstate 43. Photo taken by Peter Johnson (06/14/18). The first four interchanges along Interstate 41 serve the city of Green Bay. The freeway passes through western reaches of the city between Wis 29 and CTH-VK. Photo taken by Peter Johnson (06/14/18). The forthcoming split of Interstates 41 and 43 lies one quarter mile ahead over an area of wetlands and Duck Creek. Upgrades here replaced a low speed folded diamond type interchange between the two freeways. Photo taken by Peter Johnson (10/28/16). Exit 170B separates from the left lanes of I-41 & U.S. 141 south for Interstate 43. I-43 wraps around the north and east sides of Green Bay to Bellevue. Photo taken by Peter Johnson (10/28/16). Beyond Wis 165 and County Q (Exit 347) drivers pass by one final set of confirming markers for the trio of Interstate 41 & U.S. 41 south and Interstate 94 east in the state of Wisconsin. Photo taken by Peter Johnson (06/25/16). A set of shields line both sides of I-94 east & U.S. 41 south marking the end of I-41 at the Wisconsin-Illinois state line. Though not signed on the Illinois side, I-41 continues south an additional 2.5 miles to an official end at Illinois 173. Exit 1A to Russell Road (County Road A1) lies 0.25 miles ahead. Photo taken by Peter Johnson (06/25/16). Interstate 41 takes a left-hand ramp (Exit 1B) from Interstate 94 east to spur south to Illinois 173 at Rosecrans. Photo taken 06/13/15. Four lanes of Interstates 41 south & 94 east progress beyond Exit 1A for Russell Road (CR A1) to split at a wye interchange (Exit 1B). Photo taken 06/13/15. U.S. 41 emerges from Interstate 41 to follow Skokie Highway south from Rosecrans to the village of Gurnee as a divided highway. Photo taken 06/13/15. Two lanes depart Interstate 94 east for U.S. 41 south as the tolled portion of the Tri State Tollway begins. U.S. 41 advances southward to an expressway along the west side of Waukegan while I-94 stays to the west to I-294 and the Edens Spur toward Chicago. Photo taken 06/13/15. A weigh station lines the west side of U.S. 41 as the route approaches Illinois 173. Van Patten Woods County Forest Preserve spreads to the east surrounding Sterling Lake. Photo taken 06/13/15. U.S. 41 intersects Illinois 173 at traffic light. The east-west route runs 66 miles across the northern tier of the state between Machseney Park and Zion. Photo taken 06/13/15. Replaced guide signs posted at the diamond interchange (Exit 1A) for Russell Road. Interstate 94 was expanded to four through lanes on this stretch. Photo taken 05/09/10. Former button copy signs posted at what is now the southern terminus of Interstate 41. Exit 1B now carries two lanes from I-94 east. Photo taken 05/09/10. U.S. 41 advances north from Illinois 173 (Rosecrans Road) by Sterling Lake and a weigh station to directly merge with Interstate 94 west at the beginning of Interstate 41 north. Photo taken 06/13/15. U.S. 41 merges onto Interstate 94 west at a wye interchange. The route disappears as Interstate 41 takes over. Photo taken 06/13/15. A weaving traffic pattern ensues between the Interstate 41 merge and the upcoming Exit 1 departure for Russell Road. Photo taken 06/13/15. I-41 north debuts on this APL overhead at the Exit 1 egress point for Russell Road (CR A1). Interstates 41 & 94 share a 33-mile overlap to the Mitchell Interchange in south Milwaukee. Photo taken by Peter Johnson (06/25/16). The last confirming makrers for I-94 west & U.S. 41 north in Illinois stand along the freeway within the footprint for Exit 1. Motorists enter Wisconsin beyond the partial diamond interchange. Photo taken by Peter Johnson (06/25/16). Entering Wisconsin, another set of confirming markers line northbound I-41 and company as the trio pass a weigh station to the east. Interstate 41 was fully signed within the Badger state by November 2015. Photo taken by Peter Johnson (06/25/16). “Dignitaries cheer Interstate 41.” WBAY, May 28, 2015. Fiscal Year 2005 Transportation Equity Act: A Legacy for Users (H.R. 3) – PDF file. “Interstate 41 a step closer to reality.” Fox 11 News, November 19, 2012. Page updated June 15, 2018.